We can learn a lot from watching people play. The children on the playground are my favorite. It is well known that children learn a great deal about themselves and others when they play. The common expression, “Learn to play nicely in the sandbox,” wisely implies the value of childhood play in building relationships and working with others. A playground is surely a great place to learn lessons. We learn to share, to help each other, to pick up a fallen friend, to lead, to follow, to give someone a ride, or to enjoy the trip. Play gives us time to create, imagine, build and destroy. Good teachers help children learn how to try new activities, to stretch themselves, to get up after they have fallen, and to clean up and care for equipment. These all seem to be lessons that carry over to our work environments. It makes sense that Robert Fulghum’s book, “All I Really Need to Know I Learned in Kindergarten,” was a bestseller. This year, those of us who have observed our youngest children improvise their play in the Faculty Garden due to the construction of our new Innovation Center and Community Commons can verify that this generation relishes playing in nature. While it may take some time for the plants in the Faculty Garden to recover from some of the creative activities and playful experiments the children have attempted, it seems like the space has never been better used! 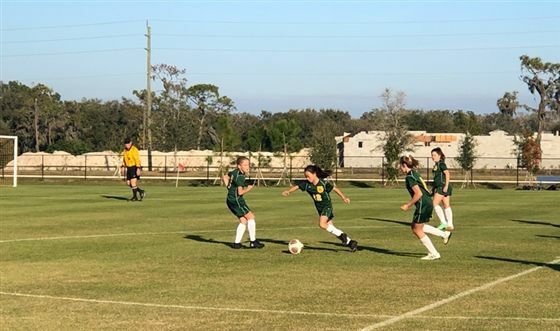 Anyone who takes the time to watch our Middle and Upper School students compete with their athletic teams sees a very different side of play. Our student-athletes are undoubtedly engaged and often enjoying the recreation. However, unlike in the first definition, I think our student-athletes and their coaches are engaged in serious activity that has many practical purposes. What can be more practical than learning how to win? What can be more practical than practicing an activity with a group of people so you can execute with mastery when put to a test? I am well aware that students in theatre, debate, robotics and math leagues have similar experiences to athletes, but we tend not to think of their activities as games. Interestingly, we do the same with swimming, diving, cross country, track, sailing and wrestling. We do not play track. Yet, the members of a 4X4 relay are engaged in a recreational activity like student-athletes in sports we call games. All of these competitions are games. The fact is, we do not need academic research to inform us that play is important for the physical, social and emotional health of people. From playing cards to being in an ultra- marathoner, from climbing a dome to climbing a mountain, people of all ages find benefit in the different types of play. The third definition of play needs some serious editing. Play should not stop after childhood. Play is good for all of us. Adults know this instinctively, especially if we are regularly engaged in an activity that feels like play to us. I am thrilled that our teachers and administrators at Shorecrest recognize the importance of both guided and free play in the lives of all our students. I am equally thrilled to see that ample time is devoted to allowing play, whether it be in the classroom or during dedicated recess time. Play is a central part of our curriculum and co-curriculum. There is nothing “extra-curricular” about play. It is a fundamental element of teaching and learning.